In BusinessWorld, Bobby Ang writes about Fischer's wild oats. Tonight the New Jersey Knockouts square off against the New York Knights, in the U.S. Chess League. 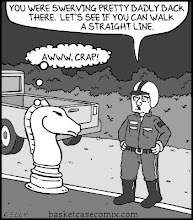 Follow the action at the Internet Chess Club. Pictured above are the three prize winners in today's grand prix event at Chess Mates, Justin Sarkar (2nd place), Yaacov Norowitz (1st place) and Mauricio Camejo (3rd place) respectively. Rahul Swaminathan and I tied for 4th place. 46.Qd4 Rg4 47.Qd3 Bg6 48.Qb5 Re7 49.Qxd5 Rge4 50.Qd8 f4 51.Qd6 Bh5 52.Qc5 Re2+ 53.Kg1 Re1+ 54.Kg2 R7e2+, White resigns. The Marshall Chess Club proudly presents GM Mark Paragua. The Filipino grandmaster will give a lecture on the Slav Defense. Tuesday, August 31, 2010, at 7 pm. 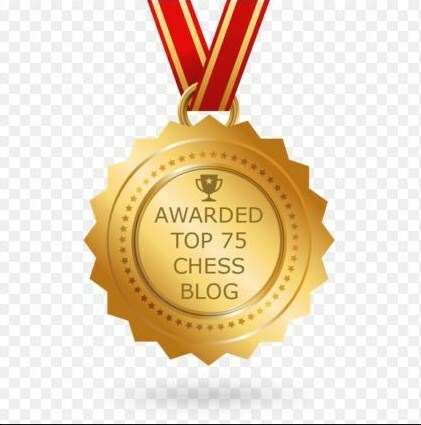 On November 27th, international master Dean Ippolito plans to break the record for most chess games played simultaneously by one person and the best winning percentage in a simul. 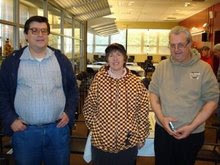 On Monday, the Philadelphia Inventors scored a first round victory against the New Jersey Knockouts in the United States Chess League. 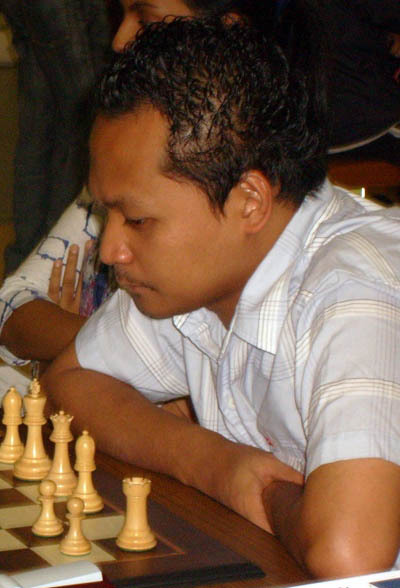 DOCA FIDE Invitational @ "CLO"
At Chess Life Online, tournament director Aaron Kiedes recaps the 2nd Annual FIDE Invitational. These pictures were taken by me during the final weekend of the 2nd Annual FIDE Invitational at the Dean of Chess Academy. 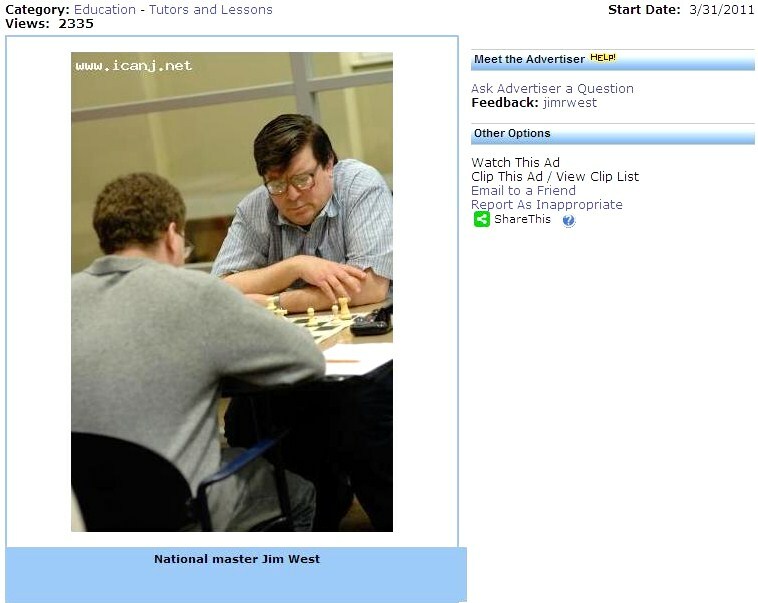 Here is the update from the Dean of Chess website. This year there were 3 FIDE hopefuls. All of them were successful in obtaining a FIDE rating. IM Dean Ippolito won the event with a 9/9 score. 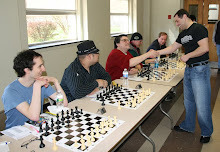 For the second year in a row National Master David Grasso finished second, this year with 5.5/9. 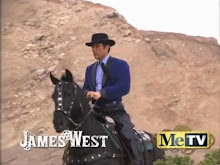 Life Master James West and Rahul Swaminathan finished tied for third with 5/9 points. All of the games can be found at deanofchess.com. We would like to thank Aaron Kiedes who directed the event. 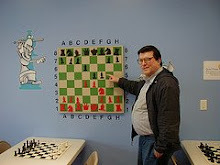 More such events are planned as the second Dean of Chess Academy is opening next month in Flemington, NJ. Between both centers, more than 50 events will be run on a monthly basis in the 5,000+ square feet available. We are looking forward to attracting all types of players, and are holding Grand Prix events every week. The 2nd Annual FIDE Invitational ended yesterday at the Dean of Chess Academy. 32.g6 fxg6 33.Rxe5 dxe5 34.Bxe5+ Kg8 35.Bxb8 Rxb8 36.e5 c4 37.e6 Qe7 38.Qc3 Rb3 39.Qe5 Rb5 40.Rf7 Rb1+ 41.Bf1, Black resigns. 29.Bd2 exd4 30.Bc2 d3 31.Bxd3 Ne5 32.Qe2 Nxd3 33.Qxd3 Nc8 34.Ra8 Nd6, draw. The final weekend of the 2nd Annual FIDE Invitational began yesterday at the Dean of Chess Academy. 30.Ke4 Kc7 31.h3 Nf7 32.Kf4 Kb6 33.Bb4 Kc7 34.Ba5+ Kd7 35.Bc3 Ne5 36.Ke4 Nf7 37.Kf4 Ne5 38.g4 Nf7 39.h4 h6 40.Ke4 Kc7, draw. I got lucky in this game when my opponent hung his queen. 24.Qd5+ e6 25.Nxe6 Bf3 26.Qb3 Qb6 27.Nb5 Qe3+ 28.Qxe3, Black resigns. 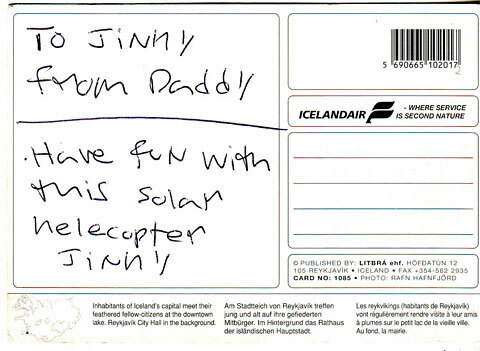 After paternity test results showed that Bobby Fischer was not the biological father of Jinky Young, despite "strong secondary evidences" like the postcard shown above, the lawyer representing Jinky's mother Marilyn has criticized how the tissue samples were obtained. 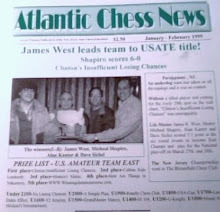 At 365Chess.com, many of the 66 games that are credited to James R. West were never played by me. Obviously, the 11 Philidors are mine. But I never played in tournaments at Plymouth, Monroe, Manila, or Foxwoods. To paraphrase Yogi Berra, "I didn't play half the games I played!" Here are pictures taken by me during the first weekend of the 2nd Annual FIDE Invitational at the Dean of Chess Academy. 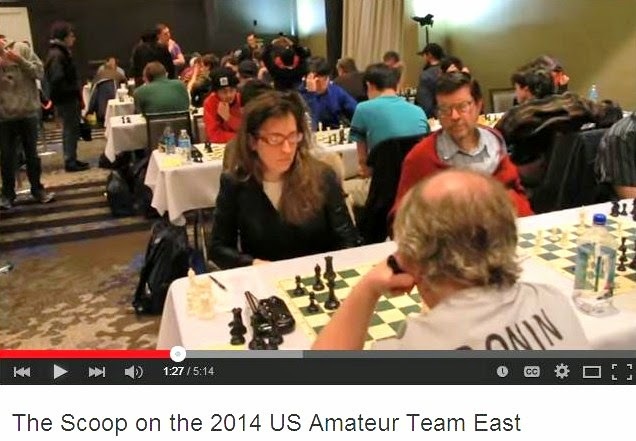 The following update can be found at the Dean of Chess website. Many upsets at this year’s FIDE Invitational have led to many surprises in the standings at the midway point. Last year’s winner with 7.5/9 IM Dean Ippolito, has begun this year’s event with a 5-0 score. Second place is a huge surprise though, with the lowest seed, FIDE unrated Daniel Zhu at 3.5/5 on pace for a high FIDE rating. NM James West is tied for third with the second lowest seed, FIDE unrated Andy Walker with 3/5. Last year's 2nd and 3rd place finishers respectively, NM David Grasso and Rahul Swaminathan currently find themselves in the middle of the pack with 2.5/5. One of the pre-tournament favorites FM Steve Stoyko stands at 2/5 with FIDE unrated Matthew O’Brien. Steve Ferrero is currently ninth with 1.5 and Kevin Chen stands at 0. The tournament will conclude this coming Saturday and Sunday. The mission of the FIDE Invitational is to give NJ residents, who previously haven’t had the opportunity to achieve a FIDE rating, such an opportunity. Also, young up and coming players will get the opportunity as well as higher rated Dean of Chess Academy members. 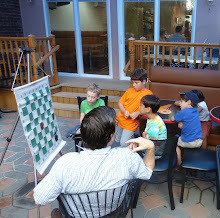 The Dean of Chess Academy hosts FIDE rated quads three Monday nights each month. A second Dean of Chess Academy will be opening next month in Flemington and will also feature more such events. Between the two academies, Dean and his staff are scheduled to run over 50 events per month, one at each center just about every night and weekend. Here is the leader’s favorite game of the tournament so far. A paternity test has shown that Bobby Fischer was not the biological father of Jinky Young. 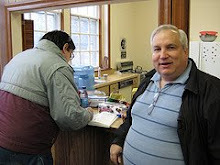 For the second time in three years, Michael Goeller [pictured] of The Kenilworthian has won the Best Blog Award from the Chess Journalists of America. The first weekend of the 2nd Annual FIDE Invitational ended yesterday at the Dean of Chess Academy. 53.Kf2 Kf7 54.Kg3 Rh1 55.Kg2 Rh4 56.Rb1 Kf6 57.Kg3 Kg5 58.Rb5 Rh1 59.Rxe5+ Kg6 60.Kf4 Rb1 61.Re6+ Kg7 62.Ra6 Rb5 63.e5 Rc5 64.Kf5 Rc7 65.f4 Rc1 66.Ra7+ Kh8 67.e6 h5 68.Kg6, Black resigns. 51.Kxc3 Kg6 52.Bc4 Bc8 53.Kd4 Kxh6 54.Kc5 Kg5 55.Kd6 Kf4 56.Kc7 Bf5 57.a6 Ke5 58.a7 Be4 59.Ba6 Kd4 60.Bb7, Black resigns. 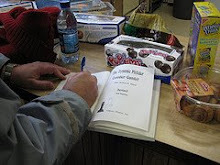 Lenderman Fundraiser for "Art of Attack"
Sarkar - West @ "Contre Gambit Philidor"